My birthday is this month, and I need a pair of big boy binoculars. Ones that will take me into my golden years without any worries. So with more pennies saved the obvious choice is a pair from Vortex Optics. Now, it’s not that my present bins (Leupold Acadia 8×42) are bad binoculars. On the contrary, they have some good points as well as some bad ones. I just want something better when it comes to magnification, exceptional lens quality, close focus ability with that killer VIP warranty. So I’m stepping up without breaking the bank on the Vortex Talon HD 10×42 binoculars. When I bought my Vortex Razor spotting scope last year the amount of research I put into this purchase would have made the editors of Consumer Report proud. Multiple criteria had to be made before I wrote the check. And you might ask what those criteria might be. Well, considering that I never put an eye to my Vortex spotting scope before buying it, you really have to trust what you read and be sure to consider the negative as well as the positive. The same research I put into selecting my spotting scope has also been duplicated when I made the decision to buy the Vortex Talon. 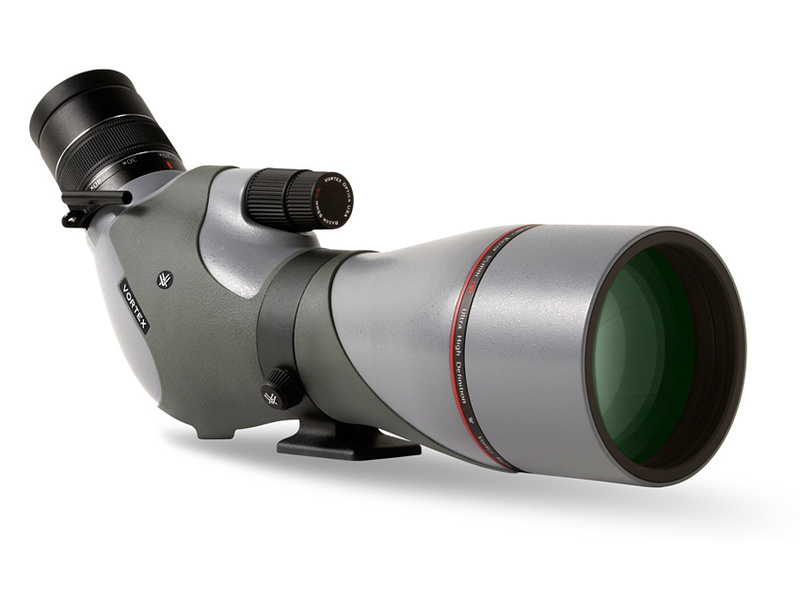 Scope Specifications: Already using a 20-60×80 scope , I wanted at least with this magnification and optical lens size. I needed a scope that would allow me to digiscope. Not only does this scope has this capability, but Vortex sells all the proper attachments to make attaching your camera a breeze. I wanted top quality HD, fully coated lens that are water, fog, dust and shock proof. With the Vortex Talon’s I wanted a little more magnification, hence the 10x, without compromising on the close focus. Which is a must when birding at places like Magee Marsh on the boardwalk. The lens are fully coated HD much like my spotting scope. Reviews: I must have read every review I could find online prior to purchasing both my spotting scope and binoculars. The reviews were from both consumers and experts who would do side by side comparison with top notch scopes and bins. Even though they might not have been the top in their category, they rated high with affordable, quality optics. Price: A HUGE factor. I had to save every penny to afford both the Razor and the Talon, but considering what I was ultimately getting when it came to the specs, I feel I got a bargain. Warranty: This is the clincher for me. A unlimited, lifetime, transferable, no fault, 100% guarantee at no charge. No warranty card or receipt needed. The only thing it doesn’t cover is theft, loss, or deliberate damage. Now who wouldn’t be sold on a warranty like this. I think the bottom line in all of this is getting the most bang for your buck. And with Vortex Optics, I do. There were white-caps on Caesar Creek Lake today. Scanning the water from the end of Harveysburg Road the wind was a cold slap in the face that was needed to wake me up this morning. It was a bitter start to the day, and with the fury of the wind blowing in your face it made birding difficult to say the least. My spotting scope would vibrate on the tripod from the wind blowing. I needed two hands to hold it still. AAHHHHH, winter bird watching at it’s best! It’s been awhile since I’ve hit the hot spots around the lake, and today was as good a day as any. I really do love this lake and the wildness about itself on days like today. Birds were scarce on this first of many stops around the lake today, so after giving the lake the twice over it was on to the next stop. At the end of Old State Route 73 there is a gate that won’t let you drive any further. There’s a control building that the Water Works Department uses that has something to do with the water tower located nearby. However as you walk past the building, and down this paved path, it takes you right to the waters edge and the beach directly across. Being in close proximity to Harveysburg Road this is one of my “must stop and look” locations. Canada Goose with American Coots near the Youth Pond. I was making my way towards the beach in another attempt to locate the Franklin’s Gull that eluded me the other day. By this time the sun was starting to warm things up despite the winds persistence to keep the wind-chill below the human comfort zone. At the beach, with the wind more towards my back I noticed 3 figures bent over their spotting scopes silhouetted against the back drop of the trees. In the parking lot I recognized one of the cars, but not the other 2. As I approached them from behind the person in the center of the group turned around and greeted me. Rick Asamoto, John Habib and Mike Busam are talented and skilled birders and this will be a treat to buddy up with them. Having birded with them several times in the past they seemed glad to include me. It’s times like this that us novice birders try to absorb as much knowledge that they dish out. They were scoping out a large flock of the resident Ring-billed and Herring Gulls trying to ascertain if this one lone bird was the California Gull that was supposedly spotted here the other day. It pretty much became a moot point as the birds scattered as we tried to get a different view of them. Rick, John and Mike’s plans were similar to mine, hit as many hotspots as you can. So the next stop was across Rt. 73 and Furnas Shores Boat Ramp. As we pulled in we were directed into the parking lot instead of straight down the boat ramp by a couple of guys who were manning a check point for a Cross-Country race. That’s when we noticed runners exiting the woods and re-entering it after this check point. The effort to get to the waters edge took longer than we were there. No much happening, so on to the next stop. The Visitors Center to warm up and use the facility. A male Purple Finch enjoying the feed at the Visitor’s Center. A White-winged Scoter has been seen from the observation platform that overlooks the dam for several days, and we weren’t disappointed as we re-located the bird swimming with a Lesser Scaup at the base of the dam. The distance from myself to the Scoter and Scaup is roughly 330 yards. I love Google Earth and this feature. As I stated in my post from February 22nd when I spotted the 2 Surf Scoters at Harveysburg Road, one of the field marks to differentiate between to 2 Scoters is a small area of white that appears on the wing. This can be really difficult to view if the Scoter is just swimming. You have to wait till either the bird flies away or rears up and flaps it’s wings. This picture was taken from a different vantage point. Across from the Observation deck at the Visitors center there is a picnic grove with it’s own observation deck with a closer view of the dam. You can also walk right down to the waters edge, so the above picture is about 250 yards from the bird. You can see the bold white mark right behind the bill. A Surf Scoter’s white mark is a little less white. So I waited till I could get a good diagnostic picture of the Scoter showing some white on it’s wing. This took awhile. I hated to leave the group but I really wanted this picture. On several occasions the Scoter would rear out of the water and flap her wings, which really showed off the white secondaries. However I did get lucky with just 2 pictures, despite their crappiness, which shows some white. A great diagnostic picture of the white spot on a folded wing. Here’s a good view as the Scoter lifts her wing to preen. It was getting close to noon when I left the park to meet with some birders. I recently found a bird watching group on the web that sparked my interest. It’s called The Cincinnati Birders Meetup Group. Web sites are formed across the country as a way to meet like minded people using this “Meetup” format. So if you have any interest or hobby, their is a Meetup group for you probably in your area. So today I made an arrangement to meet anyone from the group who wanted to view the now famous Long-eared Owl of Hisey Park. I think the weather scared them off, so after several minutes waiting in the parking lot at the McDonald’s in Waynesville, it’s back to the lake and hook back up with Rick, John and Mike at Harveysburg Road again. This time Mike was gone and Kathi Hutton, another birding friend, was there. The wind was still strong out of the Northwest, and being in such an exposed area we quickly scoped out a lone Common Goldeneye and a small pod of Black Ducks and Mallards. Onto my last stop for the day which was the boat ramp at the camp ground. From this vantage point we’re able to see the last large basin of the lake before it narrows down further north near the Young Road boat ramp. A Herring Gull in the middle of a group of Ring-billed Gulls. It’s from the camp ground boat ramp that we were able to spot our 2nd Scoter for the day. We spotted a 2 Surf Scoter swimming with 2 Lesser Scaups in a real choppy lake. The next few pictures may not be the best, but they were enough to make a proper ID on the Scoters. This picture you can really tell how much chop was on the lake caused by the high wind. But you can see the faint white marks on the face and how they differ from the marks on the White-winged Scoter. It was time to leave unfortunately, John Habib was heading over to Spring Valley and I wanted to go, but alas not today. It’s been a long time since I’ve had a 40+ bird day in the winter, so I was very pleased with today’s count. Dedicated to the birder, as we start our week. Today was one of those days where I felt the need to go birding despite the grayness on this Ash Wednesday. Kathy was at school for the rest of the afternoon, so not needing any more excuse than that, I made my way up to the lake after picking up my gear at home. Caesar Creek has been a bevy of activity since the weekend and I’ve been chomping at the bit to get a piece of the action. The most notable bird has been a Franklin’s Gull, which has been seen with regularity at the beach. So my first stop on this abbreviated trip was the beach. Walking past 2 Canadian Geese honking disapprovingly at my encroachment on their turf, I made my way towards the waters edge and the large group of gulls. Being several inches smaller than your typical Ring-billed Gull, I was scanning for the familiar black hood amongst all the other gulls. Dipped again. It’s not like I need this bird for my life list, I just wanted a picture for the old photo album. I was able to get a few pictures of some Greater Scaups that were about a hundred feet of the beach. My next stop was across Route 73 to the Furnas Shores Boat Ramp. I only spent a few minutes here as I scoped out a few more Greater Scaups, a pair of Buffleheads and a Horned Grebe. My final stop before heading home was my all time favorite spot, Harveysburg Road. Walking down to the edge I noticed 3 darker shapes no more than 1 hundred feet off the end. And there, right before my eyes were 2 female Surf Scoters and a male Common Goldeneye. There’s been a bit of a buzz about these 2 scoters for a couple of days now, and here they are right in front of me. Even though this is a crappy picture, you can see the 2 white marks on the head. The female White-winged Scoter has those same kind of facial markings, however the Surf Scoter has a darker top of the head and a darker bill. And no tell tale sign of the small white patch on the wing which would indicate a White-winged Scoter. With the light fading fast, I bid farewell to Caesar Creek…till Saturday when I work the lake hard for that Franklin’s Gull. I received a interesting comment on the blog the other day. It was from Penny Jarrett, a volunteer for Little Miami Inc. She had a great idea where birders would bird a section of the Little Miami River during the “Great Backyard Bird Count”, that was held February 17th, thru the 20th. Since Little Miami Inc. owns over 50 nature preserves along the river and it’s tributaries, in reality we’d be birding in the Little Miami River’s backyard. Founded in 1967 as a non-profit organization dedicated to restoration and protection of the Little Miami Wild and Scenic River, I thought it was a super idea as I talked to her more about this idea. Now granted it was a little late in getting put together, however there has to be a start someplace. She even enlisted the help of Kelly Riccetti of “Red and the Peanut” blog to call upon some of her friends to help with a section near the powder plant in Kings. For myself I asked Phil to join me today as we birded Kelly Nature Preserve. Situated along a bend in the Little Miami River, Kelley Nature Preserve is a beautiful 42 acre preserve left to the Clermont County Park District by Virginia Kelley as a memorial to her husband Walter A. Kelley. Phil and I arrived at 4:30 not knowing what kind of birds we’d find, having never birded here before. And considering the reputation the park has I’d never go there by myself, but Phil was along and everything went fine, except the birds. Being late in the afternoon this doesn’t surprise me, which I told Penny would probably happen. It’s a nice park with well manicured trails and some good views of the river which at certain points you can walk right down to. We spent about 75 minutes here with very sporadic bird activity. We didn’t cover every inch of the park, but with the fading light I feel we left at the right time to get home before it got too dark to see any bird. I was able to digibin this Red-bellied Woodpecker as it clung to this bush eating their small berries. The sun was really low and the picture was darker than it appears here. I had to do some heavy cropping to get it this lightened up. Description: 23″- 26″ (58-66 cm) ADULT SUMMER Has a pale blue-gray back and upper wings, except for white trailing edge and dark wingtips with white “windows”. Plumage is otherwise white. Bill is yellow with orange spot on gonys, and eye has yellow iris and orange eyring. 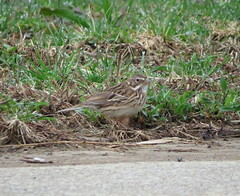 ADULT WINTER Similar, but head and neck are streaked brown; leg, bill and eyering colors are duller. 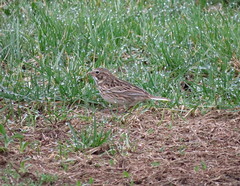 JUVENILE & 1st WINTER Have mottled brown plumage, dark tail, and dull pink legs. Initially bill is dark, but becomes dark-tipped pink by first winter. Note pale inner primaries create pale panel on upper wing and otherwise uniformly brown upper wings. 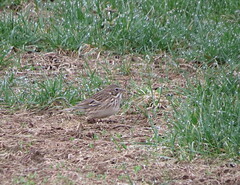 Adult plumage acquired through successive milts: becomes more uniform gray on back and upper wings and whiter elsewhere. Retains dark band on tail and some brown feathering on upper wings into third year. Habitat: Widespread and common, nesting on islands in northern lakes and on coasts. Winter range is mainly coastal. Nesting: 1-3 eggs, light olive, buff, or grennish with darker splotches or speckling. The nest is a hollowed out depression 10-15 inches across and lined with scrapes of vegetation, feathers, plastic, rope or other material. They prefer drinking fresh water, but they’ll drink saltwater when they must. They have a special gland located above the eyes which allow them to excrete the salt. 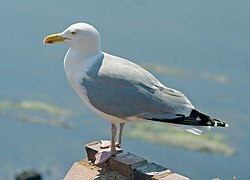 Incubation Herring Gulls will pant to cool off.